This subject will need revisiting, for sure. I love photographing what's up on the ceiling or what IS the ceiling, depending on the venue. 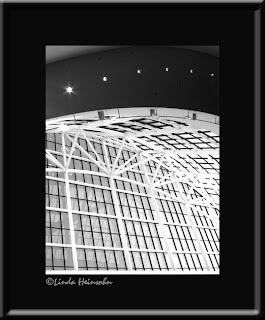 When I was in the Convention Center for the auto show, I took just a few shots of the skylighted ceiling. It's pretty dramatic from the outside at night. Looks like it could be a P-town cousin of the So-Cal Crystal Cathedral! Only for conventions not religious broadcasts. I've tried to get shots of the place at night from outside while driving slowly, but have not wanted to be a woman alone in that neighborhood walking around with a camera after dark. So, this was kind of a grab shot as we were leaving the auto show from the inside. I played with the IR settings in PSE to see what I could get on this photo. Not sure I like it better than the original color version. Since it was a sunny day, all the windows are aqua and the ceilings look brown (which I'm pretty sure they're actually not).